The Direct Message Lab REACH platform is a comprehensive social engagement tool for brands. Take a walk through our platform in this video. Strategy: DML identifies the key social media locations for your brand (e.g., by demographics, category) and we build a roadmap to effectively reach users in these locations. Implementation: We build new pages, create new profiles, integrate into your existing locations and deploy the applications that will resonate with your target users. Our team handles all of the technical work and we train your team on how to use our platform. Deploy Content: Your team creates posts, comments, videos , surveys and other content that the platform automatically delivers across all of your social locations. Measure: Data is gathered for each location, for each piece of content delivered, through each application and from each user. The data gives you the entire social picture of your brand and your users. We present the data in our dashboard to help you drive better decisions, the right content and ROI. In this whitepaper you will find: Key data that organizations can collect within social media networks. Ways that top organizations are using the social media data they collect. The importance of and how to connect the collection of social data to other marketing efforts. In this whitepaper you will find: Feedback from brands like yours on how and where to participate in SM. Rules for successful social media engagement. Tools to increase your efficiency and increase the size of your audience. In this whitepaper you will find: Benefits of an effective social media program for an association. Five foundational best practices for social media success. The calculator will help you: Determine the ROI from your social media efforts. Link social media to your email and other efforts. See the techniques other brands use to determine their ROI. Direct Message Lab Tactics and Strategy Series: Running Successful Facebook Sweepstakes In this Tactics and Strategy update you will find the key elements that enable brand to get the most out of their Facebook sweepstakes. Avoid the pitfalls of others by leveraging Direct Message Lab's work with many of the world's top brands. Walking the Loyalty Tightrope: Increasing Revenues by Increasing Relevance in Your Loyalty Program In this whitepaper you will find: Examples of loyalty programs achieving success in social media. Three lead best practices for social media success. How to create more relevance for your users. 2011 Association Social Media Survey Results Direct Message Lab wanted to help associations understand how organizations in their industry viewed social media from tactical (what are we currently engaged in now), financial (what should I budget and what should I expect in return) and strategic (what should I do?) perspectives. To do so, Direct Message Lab reached out to over 200 associations to capture their responses to a variety of questions on social media within their organization. Their answers help all us understand how association view and apply social media as a driver of key elements of their business. Direct Message Lab Tactics and Strategy Series: Sample Marketing Calendar for Running Successful Facebook Sweepstakes Creating a cross-channel marketing calendar to support your Facebook sweepstakes is vital to the success of the overall program. In this Tactics and Strategy Update you will find a sample marketing and communication calendar which Direct Message Lab's brand partners have used with success in the past. The key - use all your channels to support each other and the program as a whole. In this whitepaper we will review: Key trends in digital and social media management for sports enterprises. Use the Personal Beauty Profiler to find the products that works best for you. Then share with friends. Be the first to find out about Taca’s best offers and share them with your friends. Connect activity in your social and mobile apps with your email database. Now you can see the whole customer. Loyalty 360 is the leader in loyalty strategy, thinking and cutting edge research. Brandstand enables restuarants to create a complete social marketing package - acquiring new customers and driving more customers to dine more frequently. 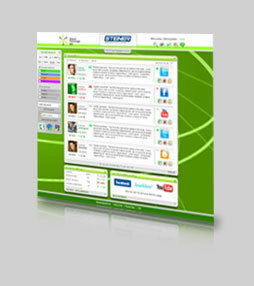 Enable users to post your message to their social profiles and share with others. Plus display cross-sell opportunities targeted to them. Grow your email list, drive fans, increase engagement and track everything. Leverage the content from your social pages, mobile apps and social apps to improve your SEO by automatically (or on a moderated basis) deploying content to keyword based landing pages. Want long-term engagement? Let users accumulate points for filling out surveys, sharing and taking other actions. Then let them cash in the points for new content or great promotions. You gain invaluable data on your best users. Let us support your applications throughout the lifecycle of your projects. From helping your local teams with the launch through ongoing first level and second support DML will make your application a success and free up your marketing team's resources.